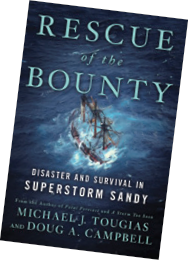 Several months ago our friend Michael J. Tougias, the award-winning author of several excellent books about disasters and daring rescues at sea, generously granted WindCheck permission to publish an advance excerpt from his soon-to-be published Rescue of the Bounty. Tougias is the master of this genre, and this book, co-authored with veteran journalist and accomplished offshore sailor Douglas A. Campbell, is among his very best. In a stunning lapse of judgment, the captain of the ill-fated tall ship, Robin Walbridge, elected to set sail for St. Petersburg, FL from New London, CT on Thursday, October 25, 2012. Well aware that the ship under his command, built for the 1962 film Mutiny on the Bounty, was in poor condition and that one of the largest Atlantic hurricanes in history was forecast to strike the East Coast of the U.S., Walbridge was nonetheless determined to sail. Explaining to his crew of 15 that “a ship is always safer at sea than in port” and that he intended to “sail around the hurricane,” Walbridge gave those who didn’t want to sail an opportunity to leave the ship, with no hard feelings. No one accepted that offer. When Sandy hit the Bounty four days into the voyage, her pumps, badly in need of repair, were unable to keep up with the incoming water. Battered by 30-foot waves, the ship overturned that night, triggering one of the most massive and dangerous rescues in U.S Coast Guard history. An artfully crafted recounting of a needless tragedy that takes the reader aboard the doomed ship and the rescue aircraft, Rescue of the Bounty is highly recommended. Michael J. Tougias has written or co-written 23 books, including A Storm Too Soon, Overboard, Fatal Forecast, Ten Hours Until Dawn and The Finest Hours (with co-author Casey Sherman), soon to be a major motion picture by Disney. A resident of Massachusetts, he is also a popular lecturer who gives more than 70 presentations each year. You’ll find his speaking schedule at michaeltougias.com. Douglas A. Campbell spent three decades in daily journalism and 25 years as a staf writer at the Philadelphia Inquirer, where two of his stories were nominated for the Pulitzer Prize. He is the author of The Sea’s Bitter Harvest and Eight Survived. An avid racing and cruising sailor for many years, he has completed the single- and double-handed Bermuda One-Two Race with his wife Monica aboard their Westsail 32 Robin. His blog is online at dougcampbellsbooks.blogspot.com.